As promised, here is feature #3 of our three-week series of upgrades. The tag-based microphone browsing tool is ready for action. 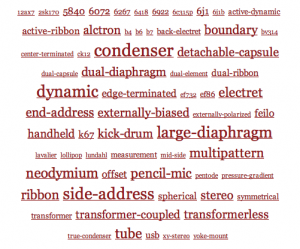 The search tool within the microphone database already gave easy access to common categories (or characteristics) such as “large diaphragm” or “pencil mics.” The tagging system actually duplicates some of that, but it goes way beyond there too — individual tube and capsule types are cataloged, for example. Transformer-coupled and transformerless mics can be easily distinguished. And we now host what is probably the world’s most comprehensive listing of Kick drum microphones. I’m pleased to note that you’ll be seeing the second generation of the mic tag cloud. Who knew linear size calculations of powerlaw distributions of population sizes could be so lame? Not me, but then I spend most of my time surfing microphone news. Fortunately for you, logarithms are also my friend (even though the first time I typed that I spelled it “logarhythms”). You can use the tagging system to find mics similar to whatever one you’re looking at; each mic’s tags are listed in the right sidebar of the mic’s page in the database. Click any tag to see other mics that share the tag. We had a couple extra minutes, so we built a compound-tag browsing tool too. You can browse any ‘AND’ or ‘OR’ combination of tags, e.g. USB-powered, detachable-capsule microphones or pencil microphones OR end-address microphones. Navigate here from the sidebar of any tag listing. Another week, another feature! We have more in the pipeline too.